Here are the boys we have and some fun facts about them. Sunshine is a Salmon Favorelle. 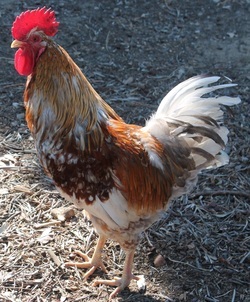 He is also very polite to his people & girls & I appreciate having roosters I don't have. to fear when I walk around with them. 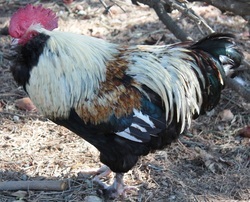 He has fathered another rooster we currently have who so far is also well mannered. 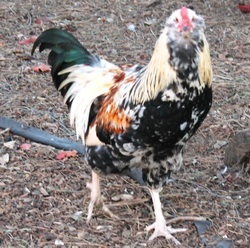 This breed is known for good roosters & so far we have not been disappointed. 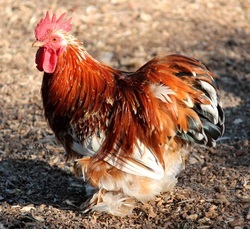 This handsome boy is a Swedish Flower Hen. He has been pretty decent but lately I wouldn't run my back on him as he has shown me some possible aggression and might be looking for an opportunity. 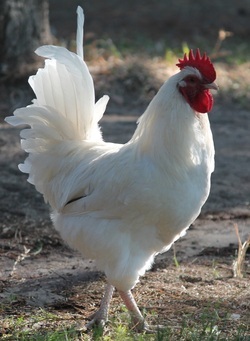 His breed is known for being cold and heat hardy and good consistent layers & people friendly. 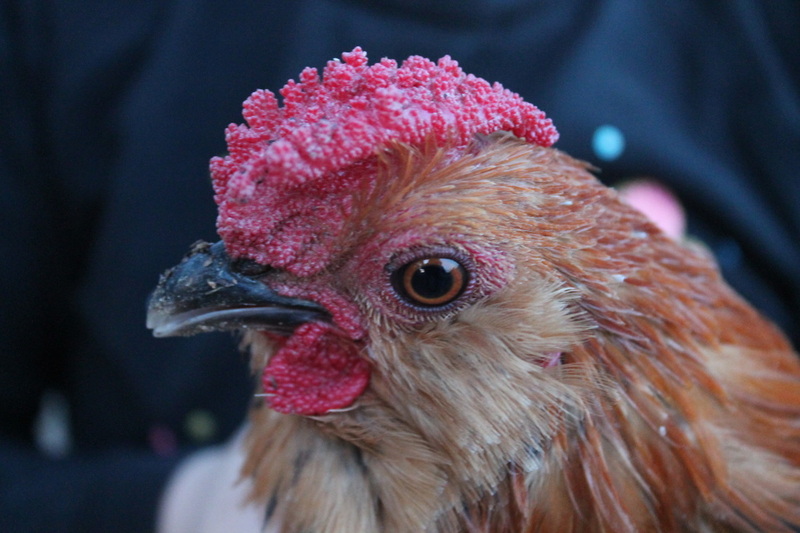 I have Ingrid, a SFH girl, for breeding pure SFH eggs. This is a our own ranch mix of Easter Egger & Salmon Favorelle. He was named Lemon Pop at birth but the kids want to change the name to Moonshine because Sunshine is his father. He did not get the fifth toe but based on his colorings there is no doubt who dad is. He has been very polite thus far & will hopefully take after his father in that regards. 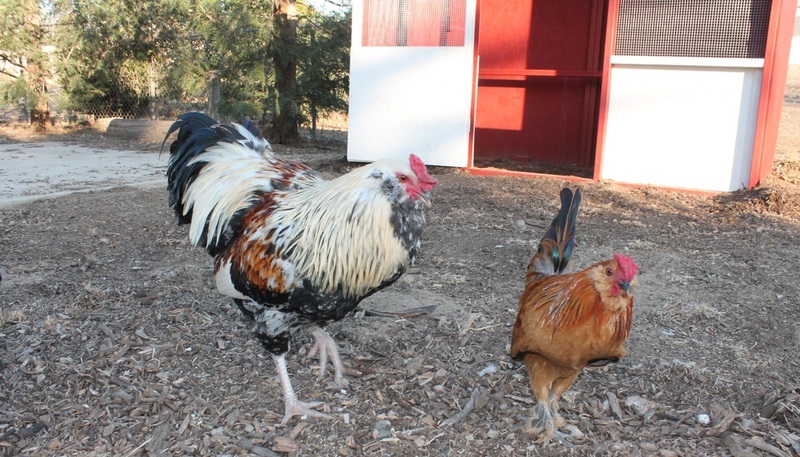 This is the smallest rooster & chicken we have. 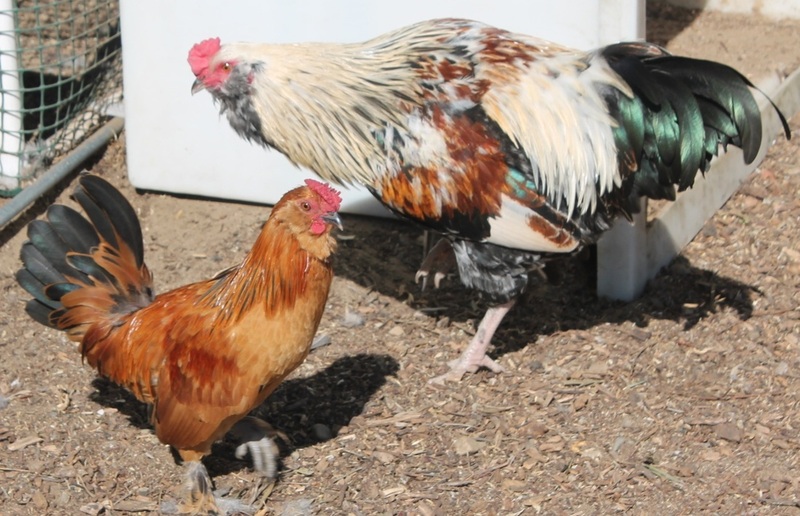 He is a Golden D'Anver/Porcelain D'Uccle mix. He was the sweetest pocket chicken...and then he crowed. Since then he is like a little Chihuahua and is always in attack mode with his wing stretched down towards his enemy. He might end up being rehomed but for now the kids are still fighting for him to be able to stay. 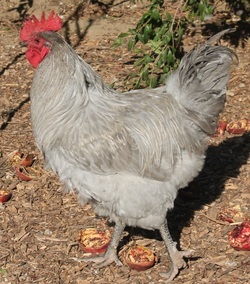 Miguel was originally "Rosie" but got a name change when he started crowing. He is a Basque, a breed that originated in Spain & was imported to the United States. He is not so polite & has gone after most of us. 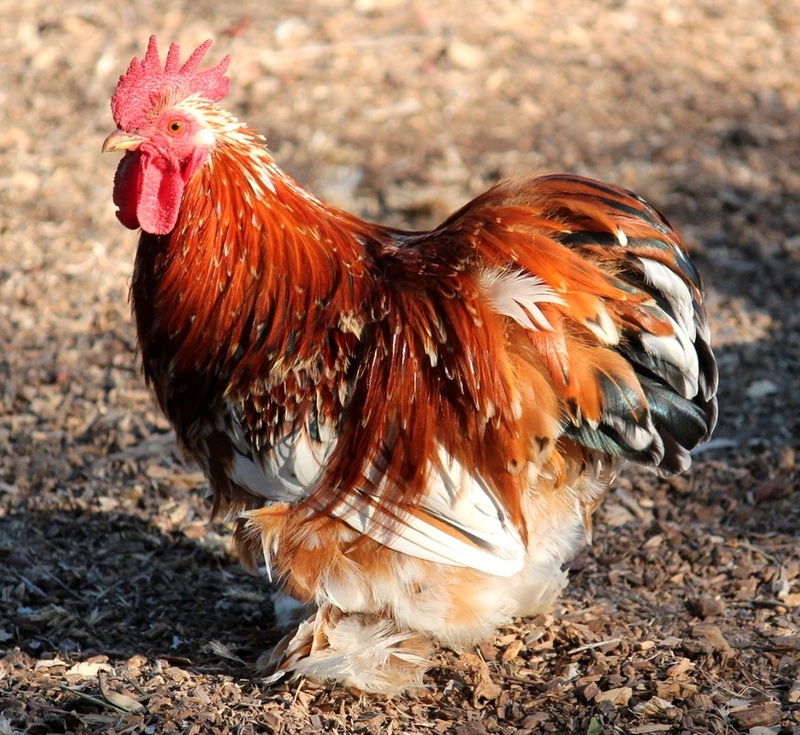 He is currently in "rooster jail" during the daytime. 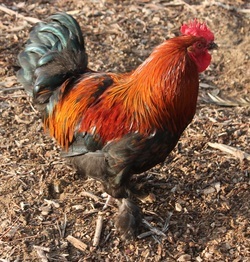 All our chickens get free range privileges but since he has shown he is not to be trusted he is penned up. 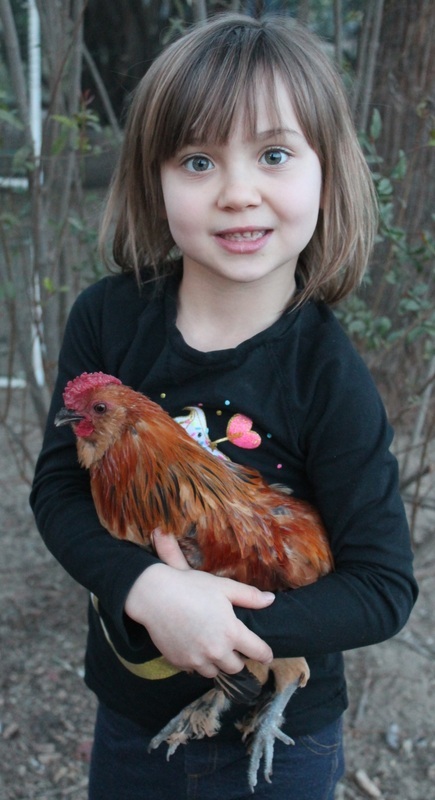 Formerly "Mouley" was one of our first homegrown chicks. 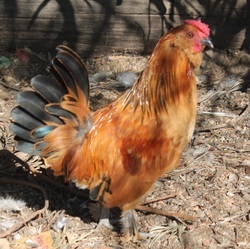 He is an Olive Egger/Bantam Cochin cross who was adopted by an awesome family who cannot keep roosters so he came back to live with us. He is still trying to fit into the pecking order & prefers to spend his days with the current batch of youngsters as they don't pick on him. Jack is no longer with us. He was a Lavender Orpington. He was very well mannered although he had one week where he thought about picking fights with people. After that he was fine and never bothered us. One day he was breathing heavy & laying down. I tried giving him water & ACV with a syringe & he convulsed & died. The water may have gone down his wind pipe or he might have just decided that was the moment to die. He is missed! Moonshine & Goldenrod at almost 5 mos old showing the size difference.